Saturday, July 7, 2018, 5:00 p.m. – 6:00 p.m.
A few days after Independence Day, we continue looking at the American composer on Discoveries from the Fleisher Collection, as we have for the past few months. But on today’s program we’ll view one of the greatest of them within an international context. Edward MacDowell has been a presence on Discoveries through the years, and we’ve played just about every orchestral piece of his—except for his most famous one, the Second Piano Concerto. He composed it in 1885, the year Tchaikovsky wrote his Fifth Symphony, and Brahms, his Fourth. Each is too long to pair with the MacDowell, although Theodore Thomas programmed the Tchaikovsky at the 1889 MacDowell premiere with the New York Philharmonic. It was a night of premieres—MacDowell’s world premiere (with the composer as soloist) and the American premiere of Tchaikovsky’s Fifth. César Franck’s Symphonic Variations also premiered in 1885, as did Gilbert and Sullivan’s Mikado. But two piano-with-orchestra works didn’t feel right for our show, and The Mikado isn’t in the Fleisher Collection. However, Johann Strauss Jr.’s operetta Gypsy Baron hit the stage that year, as did Richard No. 1. Strauss and Strauss sounded like a match. The son of Johann Strauss, Sr. came to overshadow the father, in both numbers of works and in popularity. In addition to hundreds of waltzes, polkas, and other dances, Johann Strauss, Jr. completed 13 operettas or comic operas. Der Zigeunerbaron or The Gypsy Baron is second only to Die Fledermaus in performances. We’ll hear the overture to this Hungarian-flavored dish of mistaken identity, buffoonery, and love. 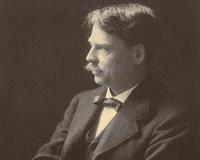 In 1885, Edward MacDowell was living in Germany. After early studies with teachers including the great Teresa Carreño, MacDowell moved to Paris and then Frankfurt for studies. He was becoming a well-known pianist and teacher, but decided to concentrate fully on composing in the mid-1880s. This is when he wrote his two piano concertos, the second a great leap forward in individuality and strength of material. Newly married, he and his American wife moved back to the States, to Boston, where he began playing and teaching again, and as we saw, he premiered his second concerto in 1889 in New York City. Madame Carreño was by this time playing many of his piano works; he dedicated this concerto to her.